So much has been written about the Brooklyn Bridge, as it is a true architectural wonder, one of the oldest suspension bridges in America. The brilliance of its designer, August Roebling, and his tragic death, have always haunted us, drawing us to admire and pay tribute since 1903. And how special it is to start a walk across—either direction is perfect. New York City’s view never fails to stun from the bridge, especially in full sun or sunset. And through a snow–magic! Coming across from Manhattan, the charm of Brooklyn Heights and the joy of Brooklyn Bridge Park await. While the designers are still adding features, the park has become a favorite for families and all the young-at-heart. Rolling hills, promenades, gardens and great views define the grand design. The park continually sees new amenities added for sports, with sand volleyball, paths for running and bikes, even a boat launch! Here is a perfect respite from days of hectic Midtown touring! Located in the Empire Fulton Ferry section is, WOW! Jane’s Carousel. Now open through the year, this beautifully restored carousel endured a rebirth and journey from Philadelphia to its permanent home in the waterfront park for year-round enjoyment. 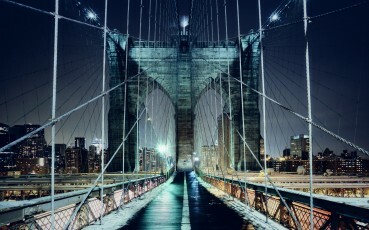 Just minutes away; if you’re in the market for hotels near the Brooklyn Bridge, make our Brooklyn hotel your choice.